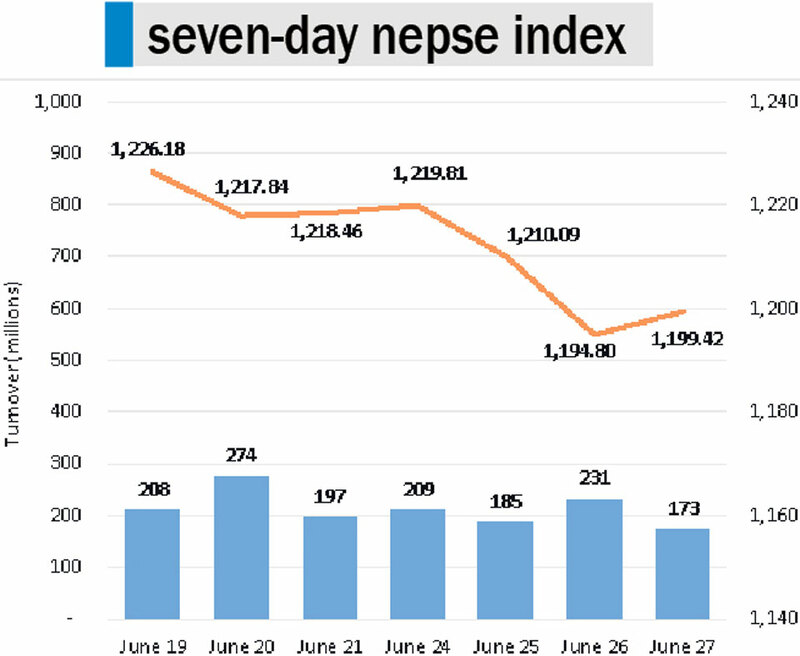 KATHMANDU, June 27: Nepal Stock Exchange (Nepse) fell below 1,200-point mark on Tuesday. Weakness was visible in the equity market since the beginning of Tuesday's trading with the benchmark index dropping 6 points early in the session. Though the dip lost steam around midday, the recover did not sustain and the benchmark index closed 15.29 points lower at 1,194.80 points. 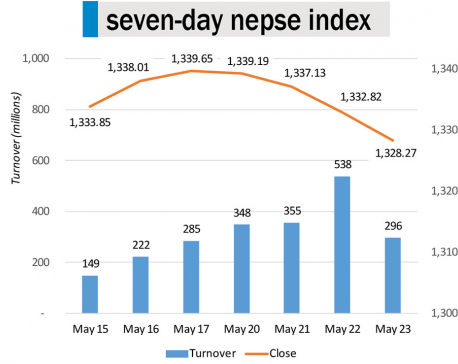 Losses continued in the bourse as investors and traders are expressing muted enthusiasm to carry out transactions in the secondary market given the lack of economic catalysts in the present scenario. The market is likely to continue its streak of passive sessions until a compelling shift in the sentiment is observed. The market witnessed a slight rise in trading activity as Rs 231 million worth of shares changed hands on the day. Nonetheless, the turnover still remained subpar. All major sub-indices moved in tandem with the broader market. Hotels stocks were under pressure on Tuesday as its sub-index declined over 2.81 percent. Besides, the sub-indices of Manufacturing and Processing, and Microfinance fell by about 2 percent each. Weakness was also visible among insurance and banking stocks, as their sub-indices fell 1.28 percent and 1.24 percent, respectively. In terms of stock-wise turnovers, banking stocks remained active on the day led by Nabil Bank Ltd Promoter Share. Over Rs 13 million worth of its shares were traded on the day. Nepal Investment Bank Ltd was next on the list with a turnover of Rs 10 million. Besides, Kumari Bank Ltd, Standard Chartered Bank Nepal Ltd and Mega Bank Ltd were the other companies on the list of highest turnover of stocks. Arambha Microfinance Bittiya Sanstha Ltd led the list of gainers as its share price shot up 4.79 percent. Further, Shangrila Development Bank Ltd, United Finance Ltd and Khanikhola Hydropower Company Ltd gained 2.74 percent, 1.88 percent and 1.72 percent, respectively. Conversely, Saptakoshi Development Bank Ltd was the worst performer of the day as its share price slumped over 7 percent. Unnati Microfinance Bittiya Sanstha Ltd also extended its correction after reaching an all time high of Rs 2,280 last week. Its stock price plummeted 6.78 percent. Furthermore, Bottlers Nepal (Tarai) Ltd experienced a decline of over 5 percent. National Microfinance Bittiya Sanstha Ltd and Civil Laghubitta Bittiya Sanstha Ltd were among other losing stocks. 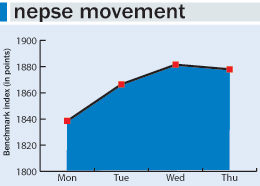 In major news, Nepse has received applications from two Indian companies for user acceptance test (UAT) of the much-anticipated online trading system. The test will last for 2 months after which access to the online platform for the general public can be expected. ARKS technical analysis indicates a bearish candlestick formation on Tuesday's session. With the day's decline, the index has breached the psychological support of 1,200-point mark. If the market fails to recover and stays below this level, the index is likely to continue trending downward toward its next support at 1,168 points. Relative Strength Index (RSI) and Moving Average Convergence/Divergence (MACD) show no indication of the selling pressure easing off any time soon.